If you are like most people on this planet, chances are that any time you go outside, you’re going to be using a pair of earbuds. Whether it’s in a train, bus, a busy street, or office, the outside noise always finds a way in between you and your music. That’s where noise cancelling earbuds come into play! However, with so many various models to choose from, picking the right one for your needs can be a very daunting task. That’s why we’ve compiled an in-depth buying guide, as well as reviewed some of the best noise canceling earbuds you can currently get. If you don't know where to start, I have an in-depth buying guide that will walk you through all the features so you can find the perfect fit. Jump to it here. Its like you pressed the mute button on life. For a wired pair of noise cancelling earbuds, you won't be disappointed by the QC20s. You can expect some serious quality in all categories considered as important when it comes to the best sound isolating headphones. Considered as the best Bose headphones that offer ANC, the QC 20s check almost all the boxes! If you’ve ever used Bose earbuds before, you will find the design of the QC 20s to be pretty familiar. The ear tips provide a solid and tight fit and manage to block most of the outside noise, even with the ANC feature turned off. A pair of rubber wings is attached to the ear tips for an additional level of secure fit inside your ears. This means that you can easily take these puppies for a run, and don’t have to worry about them falling out. The ANC box is located near the 3.5mm jack, and even though it looks big, it won’t tug on the cable that much. The actual level of noise cancellation is crazy high! It’s almost like you pressed mute on the surroundings, as 95% of the noise just fades away. Though this is pretty convenient, have in mind that it can be very dangerous as well, if you’re using these earbuds outside. That’s why Bose included a dedicated “Aware mode” button, which lets some of the outside noise into the mix, so you don’t end up in an accident or get hurt. The audio signature definitely has a slight boost in the low end, though not as much as most consumer grade earbuds tend to have. However, you can really tell the difference in audio quality with the ANC featured turned on and when you’re not using it. With it turned off, the audio quality degrades significantly. Not to a point that it’s a dealbreaker, but when compared to the potential of these earbuds, it’s very noticeable. 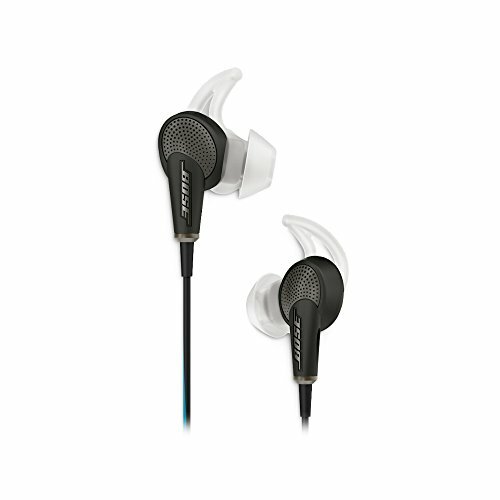 The QC 20s by Bose are considered as one of the best bose earbuds in terms of the ANC feature. If you don’t mind the difference in audio quality when toggling the ANC on and off, definitely go for this model. Everything we loved about the QC20 with the additional wireless feature and a bit better audio. 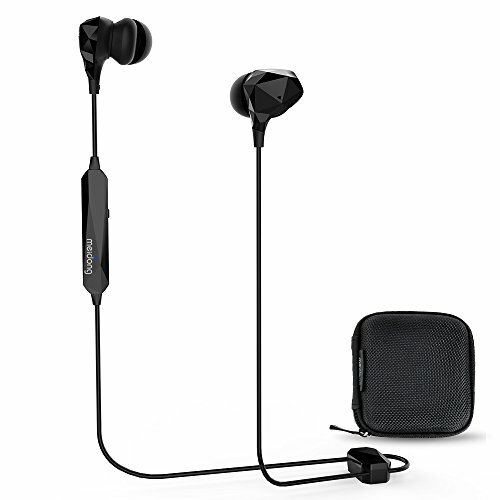 If you found the QC 20s by Bose as the perfect ANC earbuds, but want the advantages of a wireless connection, look no further than the QC 30s! Due to some users complaining about the ANC feature not working, their ratings took a minor hit. That’s why Bose added extra instructions in the product description. That doesn’t mean that these earbuds are a bad purchase, and here’s exactly why. Unlike the other wireless models we’ve reviewed so far, the QC 30s come with an interesting design choice, All of the electronics apart from the actual earphone drivers are housed in a neckband. Though this does take some time getting used to, it is very lightweight and comfortable, and won’t restrict your movement at all. The ear tips feel pretty much the same as the ones found on the QC 20s, with the rubber wings being present for an extra tight fit. The cable on the right-hand side houses a small box with a call microphone, as well as the volume and media controls. The ANC works just as good as it does on the QC 20s, but Bose decided to the exclude the “Aware mode” on this model. Instead, you can precisely adjust the level of noise cancellation via the app on your phone. If you sometimes just need to zone out, and don’t want to listen to any music, you can even use these earbuds without a music source, and they will filter out the surrounding noise. Sound-wise, we can see a noticeable improvement when compared to the QC 20s, with the bass no longer having that, in my opinion, unnecessary boost. These offer a frequency response close to flat. With around 10 hours of battery life, the QC 30s definitely fall behind most other models we’ve mentioned, but honestly, it’s still good enough to push through even a whole day of use. As the best Bose earbuds that offer wireless connectivity and ANC, the QC 30s though pretty expensive, are a safe bet! Passive noise isolation, extremely high audio and build quality for a high price. If you want the best of the best, try these out. And finally, at number 3, we have the SE535-V by Shure. If you’ve ever used a pair of Shure earbuds before, you know what to expect. If not, get ready! The main difference between these earbuds and the rest that we’ve mentioned in this review is that they offer passive noise isolation. But how come they are a part of this list that included only models with ANC? Well, it’s due to the fact that the isolation these provide can almost be matched with the rest of the ANC models. Shure sure doesn’t joke around when it comes to quality and performance. These sure aren’t your regular earbuds. What really sets these bad boys apart from 99% of other earbuds is that they feature triple high definition micro drivers. That means that you get a twetter and two small woofers inside each earbud. By utilizing 3 drivers instead of just one, the fidelity and level of detail these buds offer is unmatched. It’s like comparing standard stereo speakers to a 5.1 surround system. It’s really crazy how you can feel the spacious sound with just earbuds. Though the ear tips provide a comfortable and tight fit on their own, by wearing these with the cable going over the earlobe, you add to the fact that they’re not going to move at all. You can choose from ear tips of different sizes, and all of them provide up to 37 dB of noise isolation. The detachable cable design makes the SE535-Vs very easy to store, and you can even experiment with some other, 3rd party cables if you want. With an additional Bluetooth enabled cable (that you can buy separately), you can even transform these earbuds into wireless ones! 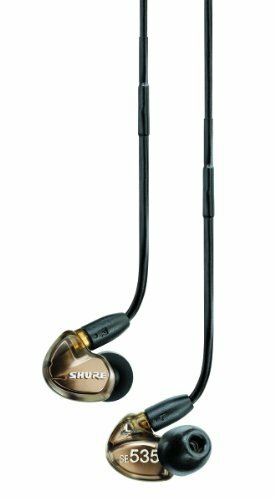 So, if you don’t mind spending a little more on a pair of, albeit, amazing earbuds, definitely go for the Shure SE535-V, as you won’t regret it. You won't have 100% noise cancellation with these. But, for an entry pair they are a great start. As one the best inexpensive noise cancelling headphones, the Audio Technica ANC23s offer amazing performance. Let’s see exactly what they have to offer. Starting with the design, it’s pretty simple and straightforward. The ANC controller is integrated into the cable and features an on/off switch, as well as volume controls. 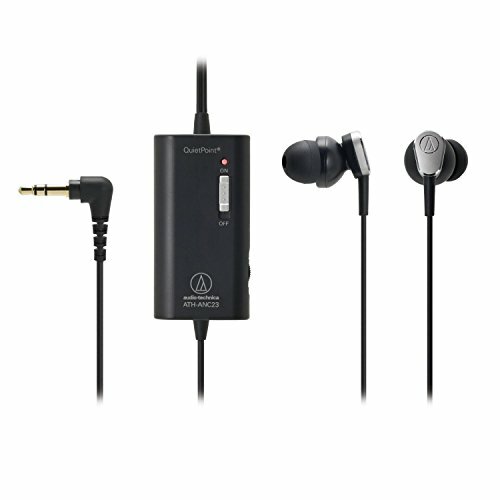 Audio Technica rates this model at 90% noise cancellation. The actual quality of this feature could honestly be a bit better. But then again, you’re not paying a ton, and for the money spent, it’s pretty good. You can easily hear people talking around you, but at a level that we found as not annoying, but even useful if you need a pair of buds which allows you to actually talk to people while the rest of the noise is blocked out. Being pretty lightweight, these earbuds are very comfortable to wear and use even after a couple of hours. The relatively tight fit is achieved by silicone ear tips, with no additional wings, flaps, or over the ear cable design. When it comes to sound quality, we were pleasantly surprised with this model. The audio was balanced, the highs were crisp, and the lows were powerful enough. No unnecessary boosts in any part of the frequency range. Offering up to 60 hours of battery life is definitely what makes the ATH-ANC23s stand out from the crowd. Some will find the fact that these work on AAA batteries as a disadvantage, but it’s great that you can always pop in fresh batteries, or simply get yourself a pair of rechargeable ones, and you’re good to go! If you’re looking for a pair of great sounding earbuds with ANC features that do the job just fine, look no further than the ATH-ANC23s! Slightly wider range than the ANC23s and a great value. Staying in the budget price range, at number 2 we have the TT-EP01 by TaoTronics. Let’s see what differentiates them from the ATH-ANC23s. Rocking a very sleek and good looking design, it’s obvious that TaoTronics wanted to make sure that these buds will last you a long time. Ditching plastic and going for an aluminum alloy build is definitely a great idea. Both the buds and the ANC box feel very sturdy and premium. A solid build doesn’t mean that the earbuds have to be heavy. The TT-EP01s are amazingly lightweight and almost make you feel like you’re not wearing them at all. The silicone ear tips are coupled with soft rubber wings that correctly position the buds in your ears, while still being very comfortable and easy to put in and take out. The ANC rating of these puppies is at 25dB, which is somewhat average when compared to the other models in this review. When compared to the previous model, you can definitely tell the Audio Technica model does a noticeably better job. The control box offers a simple on/off switch. There is also a separate little box integrated into the cable for media controls, so you don’t have to take out your phone each time you want to change a song or adjust the volume. Audio-wise, you can immediately tell that the low end has been boosted. Not as much as, for example, Beats headphones, but it’s noticeable. With around 15 hours of battery life, it’s definitely less than on the ATHs, but still good enough for everyday use. So, why should you get the TT-EP01s instead of the ATHs? 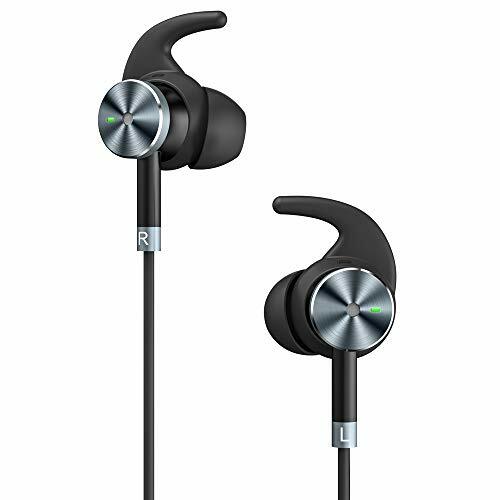 They’re great as a pair of workout ANC earbuds because of their durable build, as well as built-in playback controls. Even though the ANC is at a lower level, and there is more bass in the mix, they are still a great purchase at this price range. I don't expect a lot from unknown brands, but the Meidong earbuds proved me wrong. Though taking relatively unknown brands into consideration in our reviews is definitely risky, the model that we have at number 3 definitely turned out to be a pleasant surprise. The Meidong ANC Earbuds not only look nice but offer great performance as well. As a fan of minimalistic and polygonal design, I found the Meidong earbuds as very aesthetically pleasing. Even though these are made of plastic, they definitely don’t feel cheap! Meidong pushes the ”Say no to noise, say yes to freedom” slogan with this model, and though it does sound kind of funny, it is pretty accurate! The buds are incredibly lightweight, at around 15 grams each. This makes them probably one of the best noise cancelling earphones for running and exercising. Being able to reduce the outside noise up to 32dB puts their ANC rating slightly above average. The fact that they offer a very tight and secure fit adds to the active noise cancellation, resulting in a pair of pretty well-performing earbuds. When it comes to audio, I was honestly expecting a very strong boost in the low end. However, that certainly wasn’t the case. The audio quality was even better than some models from well-known companies at the same price range! With some minor adjustments in the EQ of your app of choice, you can get great audio. With around 10 hours of battery life, it’s safe to say that they fall beneath the average of the rest of the models in this review. However, these earbuds can be charged with your phone, as they include a micro USB OTG adapter. In the vast sea of electronic products coming from unknown manufacturers, the Meidong ANC earbuds definitely fall into the category of inexpensive gems that often go unnoticed. If you’re looking for a stylish yet practical pair of noise cancelling buds, but don’t want to spend a lot of money, they’re definitely worth considering. A great blend of performance for an inexpensive price. Check these out if you don't want to spend over $100, but still need something quality. 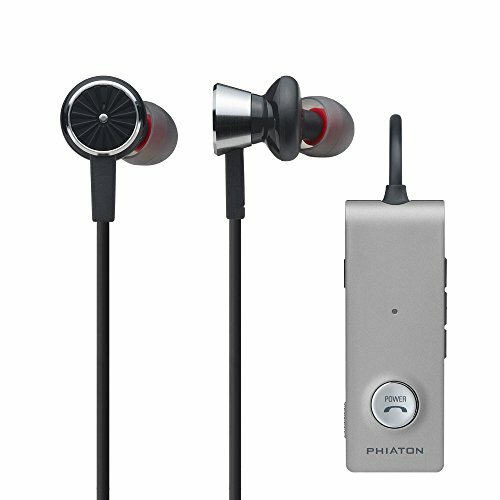 Coming at you once again with a brand that’s not considered as that well known, Phiaton, with their BT200NC offers a very practical pair of ANC in-ear earbuds. Going for a full plastic design and build, durability isn’t the strongest side of this model. They definitely don’t feel cheap, but paying extra attention while using these is a must. Not being sweat or water resistant means that working out with these, or using them in rainy conditions may not be such a good idea! However, that doesn’t mean they are not comfortable. No matter what the size of your ear canal may be, you are bound to achieve a good fit with the provided ear tips of different sizes. The slightly angled design of the buds means that you don’t need additional flaps or wings for them to stay in place. The ANC box is located at the end of the cable, as this model is connected wirelessly to your phone. It has a handy little clip, so you can easily attach it to your t-shirt or jacket, as well as a short lanyard for extra convenience. With an above average ANC rating, you shouldn’t have any problems blocking out most noise you could come across in everyday life. Even the sound signature is on point, as the BT200NCs offer a pretty balanced and clear listening experience. With the ear tips providing solid passive isolation, you can play around with the EQ and set the sound just the way you like it. All things considered, the Phiaton BT220NC are one of the best noise cancelling earbuds in the budget price range. If you don’t mind the plastic build quality or the average 16 hours of battery life, they are definitely a great model to consider buying. Sticking with AKG for audio equipment will get you a long way. This is a great product with superior quality. Going with AKG for any type of audio equipment has proven to be an excellent idea for many years now. The K391NC may just be their best in-ear headphones yet! Build quality is definitely the focus here, as the whole ANC unit, as well as the buds themselves, are made of aluminum. That makes the incredibly durable, but lightweight at the same time. The fit of the ear tips is good, but then again, we didn’t expect anything less from AKG. An inline call control box houses an additional microphone for taking calls. The design is straightforward, practical, and makes using these buds very easy. ANC-wise, the K391NCs do the job nicely in everyday use. The only disadvantage is with high pitch noise, as it, for some reason, doesn’t get filtered out enough, at least in my honest opinion. This wouldn’t be an AKG product if it didn’t offer near to flat frequency response. The highs are crisp, and the lows are deep, with no distortion even at higher volume levels. With around 35 hours of battery life, it hardly goes better than this model, at least in terms of playback time! 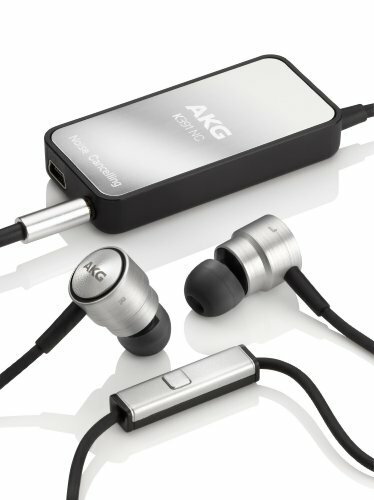 Designed for those users who either don’t really want to think about taking care of their earbuds, the K391NCs by AKG are yet another pair of durable, comfortable, and great sounding ANC headphones. For a mid-range price, you are getting great quality, so definitely have this model in consideration. Amazing audio, great ANC, and a durable design pretty much validate the relatively high price tag. Bang & Olufsen are known as a brand that offers audio products of amazingly high quality. However, with good quality come high prices as well. Their PLAY H3 ANC model is one of the best noise cancelling in-ear headphones they offer, at a relatively reasonable price. As you would expect, the design is truly aesthetically pleasing. The use of aluminum not only makes these buds sleek and great looking but lightweight and durable as well. The ear tips are slightly angled in order to fit nicely in your ear. With no additional wings or flaps, you would think that they can fall out easily. However, we found that they stayed in place most of the time. These may just be your new workout earbuds! When it comes to ANC, it was at an expected level, considering the level of craftsmanship B&O is known for. The circuitry is located in a small round box, which is, when compared to the other models, pretty lightweight and won’t tug on the cable and the buds themselves that much. It also houses a microphone for taking calls, as well as a charging port. B&O state that the ANC is capable of filtering out noises such as everyday traffic and urban noise, airplane hum, as well as people talking. From what we had the chance to test, they performed very nicely. Even before we actually tested the audio performance, I had a pretty clear picture of what I could expect from the H3. The sound was clear, natural, and on point at every part of the frequency range. However, even though I consider myself as a fan of flat frequency response audio equipment, there could have been slightly more bass. If spending a bit more on a pair of noise-cancelling earbuds isn’t a problem, the H3 by Bang & Olufsen is a great choice. Amazing audio, great ANC, and a durable design pretty much validate the relatively high price tag. Minimalistic, yet with a touch of their unique German flavor. At number 3, we have one of the best noise-isolating earbuds coming from my personal favorite brand, Sennheiser. As I’ve used their earbuds for more than 5 years now, my expectations were high when I was testing out their CXC 700 model! Starting with the design, the CXC 700s are rocking that well known Sennheiser look. Minimalistic, yet with a touch of their unique German flavor. The buds, although pretty compact, are easily gripped from the outside, and adjusting them inside your ears is a piece of cake. The silicone tips offer a tight seal while being pretty comfortable even after a couple of hours of using them. It’s the controls over the ANC that make this model versatile and convenient. You can cycle through 3 different noise cancelling modes, depending on the occasion. Mode 1 and 2 offer around 23 dB of noise isolation, perfect for traveling, or, for example, rooms with loud AC or ventilation. This model manages to block constant, droning noises almost perfectly. The third mode tones the noises down slightly less, around 15 dB, which is great for the streets, so you can still be aware of your surroundings, especially the traffic. An additional feature which I found to be pretty neat, is the talk through function. It mutes the audio and lets you hear any people talking to you in an instant. Audio- wise, the CXC 700 offer a pretty much flat frequency response, much like their CX 150 model. With around 16 hours of battery life, they are definitely going to last you a couple of days, unless you are one of those people that hardly take their buds out. If you value great audio quality as much as the ANC feature, definitely consider getting the Sennheiser CXC 700s. Even though some people may find the price range too high, you definitely get your money’s worth with this model. In order to fully understand the concept of noise cancelling, so we could objectively compare different models, it’s important to take a closer look at the actual mechanism and why it’s so practical and convenient in everyday life. Noise cancellation, aka ANC (Active Noise Control), is a method for reducing/cancelling unwanted sound and noise by adding a second sound that cancels out the first one. So, basically, you’re bringing additional sound to the one that you’re trying to get rid of. Note that this technique is called Active noise control, so it’s pretty logical that there is also Passive noise control as well. So, by adding soundwaves that are the exact opposite of the noise you’re trying to suppress, or completely get rid of, the waves end up cancelling each other, resulting more or less in silence. Here’s the actual mechanism explained in details. If you have a gaming headset for your PC or console, you might have already used this feature, as it is very common amongst headsets of this type. In order to utilize this technology, the device you’re using, in our case, a pair of earbuds, need to have a separate microphone that is recording your surrounding audio and processing it. In order to achieve the best possible result, multiple microphones need to be monitoring the noise around you. However, with most earbuds, only one mic is doing the work. Unlike active noise cancelling, “passive” means that there are no additional parts and features that are going to suppress the noise around you. If you’re using earbuds, the fact that they go straight into your ear canal means that a certain portion of the sound around you is getting blocked. Depending on the quality, price, and similar factors, various models offer different levels of noise isolation. However, passive noise cancelling, no matter how good it may get, can’t really match up with the active noise technology. So, it’s pretty clear that if you want the best possible result, going with a pair of earbuds that feature active noise cancellation is your best bet. Why and when are noise cancelling earbuds handy? You may be wondering: Why would I invest more money in a pair of noise-cancelling earbuds when conventional, passive isolation earbuds work just fine? Well, if you don’t really mind the noise of your surrounding, going with a regular pair of earbuds is just fine. However, having active noise cancellation comes in handy in various situations. Working in a loud or constantly noisy environment is not just stressful, but can lead to serious damage to your health. Sure, antiphone earguards are one way of dealing with this problem, but constantly having huge headphones on your head can get uncomfortable pretty fast. Many people who work as security at festivals and concerts often opt for this type of earbuds. This is just one example of many! Noisy neighbors, construction work nearby, babies crying all the time, are just a couple of reasons that make having noise cancelling earbuds close at hand a great idea. As your ears adapt to noise around you, using simple earplugs soon just won’t do the trick anymore. Enjoying music at a whole new level is possible with this type of earbuds. If you’re an audiophile, but for some reason don’t have the luxury of listening to your favorite tracks on speakers, getting a pair of ANC buds is a great solution. Being able to totally zone out and relax is much easier if you can’t hear almost anything around you. The bottom line is that active noise cancelling earbuds are simply a great tool that comes in handy on many different occasions. As with any pair of headphones, you pretty much have a choice between two main options. Classic Headphones, especially the models that go over the whole ear are a good choice. The fact that you have a big earcup covering, well, your whole ear, definitely adds to the passive noise suppression. Depending on the activity you’re doing while using the headphones, this form factor may come in handy, or get in the way. That’s why, in this article, we’ve decided to focus on the more practical and convenient form factor, the in-ear earbuds. In-Ear Earbuds definitely offer a higher level of comfort, especially due to their smaller form factor. Depending on the model in question, the level of passive isolation can even be better with earbuds than with regular old over the ear headphones. The choice between a wired and wireless model is generally up to you and your personal preferences. The main advantages of wireless models are that they simply offer more room for you to move, and do so freely. You also don’t have to worry about tangled cables, as most wireless models have only one cable that connects the two earpieces. The main disadvantage of wireless earbuds is that they need to be charged up from time to time. However, given the fact that the ANC feature requires juice by itself, you’re going to end up charging the buds anyway. Wired earbuds, however, can still be used for listening to music, even if you run out of power needed for the ANC. So, as we said, it’s pretty much up to you. We’ve included both wired and wireless models we found to be the best ones on the market in our review part of this article! So, you have decided to go with noise cancelling in-ear earbuds. What now? Before you go for the most visually appealing model, we suggest you take a quick look at the most prominent specs and features that differentiate the best models from the mediocre ones. If your primary reason for getting this type of earbuds is the ANC technology, taking a closer look at the actual level of suppression they offer is the number one priority. Various manufacturers measure this factor in different ways, but the most commonly used measure is in percents. So, if a model description states they offer ANC at 95%, does that mean that 95% of unwanted noise will be canceled out? When the actual earbuds get tested, it’s done in the best possible conditions. Those conditions often include noise levels that are lower than you would encounter in everyday use. It’s also important to note that certain frequencies are blocked out more easily than others, so, for example, low-frequency rumbles and high pitched tones will not be suppressed equally. Having this on your mind, you can still relatively precisely compare different models when it comes to their noise-cancelling performance, just know that the actual numbers don’t necessarily add up in everyday use! Unless you plan on using your new earbuds as just a way of keeping things peaceful and quiet, the actual audio performance of a model is an important factor to take in consideration. If you’ve ever taken some extra time to research this topic, you will know by now that the performance, and how music sounds across various models can be very different. Most popular earbuds nowadays offer a “non flat frequency response”. Well, a flat frequency response means that the headphones, speakers, or in this case, earbuds will reproduce the audio you feed them with exactly how it was recorded. There will be no boost in any part of the frequency range whatsoever. No unnecessary bass boost, which is the most present feature amongst most consumer- grade earbuds and headphones. This also means that, if you want, you can always set up the EQ yourself, if you need an extra kick in terms of bass, mids, or highs. So, if you’re looking for the best possible audio performance, look for flat frequency response models, for the optimal level of versatility across multiple genres of music! A good fit goes a long way! Not having to adjust the earbuds so they don’t fall out every minute is a crucial factor you should consider when buying a new pair. A tight fit also ensures better passive isolation. No matter how good the active noise cancellation might be with certain models, it won’t do the trick if the fit isn’t the best possible. This is especially important with this type of earbuds, as they, most of the time, have an additional “box” which houses the microphone as well as the needed electronics to make the ANC possible. So, if you jerk your head around, run, work out, or simply accidentally snag the cable on something, chances are that the added weight of the ANC box will pop the buds right out of your ears. Different brands solve this problem in various ways. Most utilize silicon ear tips for a good fit or go with an over-ear cable design. Wings, flaps, and other additional parts can also make sure that the buds don’t pop out that easily. Whether you’re planning on using the earbuds for long periods of time each day, or once in a while, I can’t stress enough how important the level of comfort is when it comes to earbuds in general. As someone that spends most of their time listening to music, whether it’s on the bus, at work, or just relaxing, I know how obnoxious uncomfortable buds can get. From an itchy feeling after just an hour of using them, to an actual headache, you really don’t want to neglect this factor when buying a pair for yourself. Unfortunately, as you can’t really tell how comfortable different models are until you try them out yourself, you will have to trust the reviews. Apart from the actual buds, it’s important to consider the cable quality, and the way and place it rests on your earlobe/shoulders, as it also can get pretty unnerving if not properly thought-out. 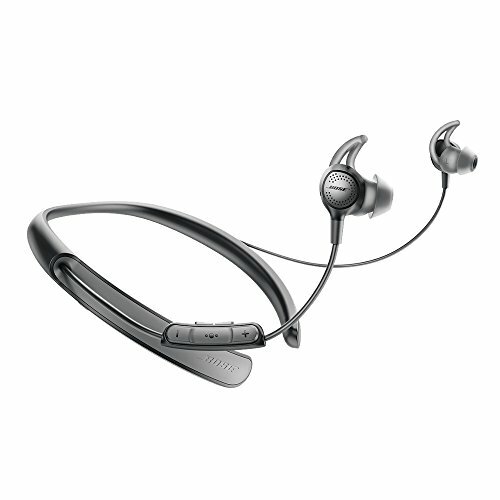 Active noise cancellation requires additional power. So, unlike regular earbuds, you will need to charge them in order for the cancellation to work at all times. Around 16 hours of battery life is the standard, so you can use that as a sort of a baseline when comparing various models. Apart from the specs and features we’ve already listed, some models offer various other additional features that may come in handy on certain occasions. A control center is a set of buttons which allows you to toggle the ANC on and off, or even set the level of the actual cancellation. This is very useful for using the earbuds in traffic, as you normally don’t want the maximal level of suppression at all times, so you don’t end up in an accident. If you plan on using these earbuds in situations that require you talking to people from time to time, definitely look for a model with this feature. That way, you won’t have to take the earbuds out every time someone wants to talk to you. A microphone for taking calls is pretty self-explanatory and is always a useful feature to have. We will definitely go over each and every model in the reviews part, so any other unique features will be discussed there! So, as you have had the chance to see, there are quite different active noise cancellling earbuds out there, each with their own unique features. The best airplane headphones – Audio-Technica ATH-ANC23, as they come with an airplane adapter for a more convenient use on flights. They offer solid ANC, as well as good audio performance, yet they don’t cost much. The best sound isolating earbuds – Shure SE535-V, as they offer amazing noise canceling levels while not utilizing the active technology at all. The best budget ANC earbuds – TaoTronics TT-EP01, offering just about everything you need, at an affordable price point. The best ANC earbuds under $100 – Phiaton BT220NC, with wireless connectivity, solid audio, as well as great active noise cancellation. So, with our extensive buying guide, reviews, and quick recap, you should have an idea which of the mentioned models suits your needs the best! We hope that you found this article informative and that it helped you! Thank you very much for reading, and we will see you in the next one! Thanks for the detailed reviews. Generally, in noise cancelling the focus is in listening and less on the mic. 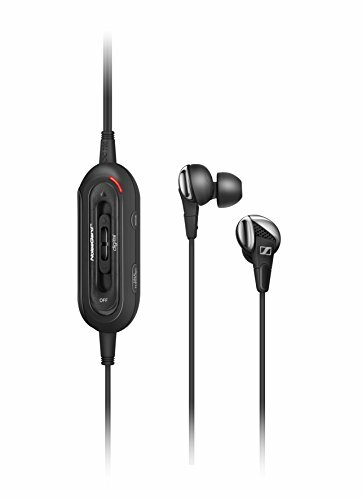 I am looking for a earbuds which can give noise cancelling at the earbuds (audio in) and mic (audio out) too. I also want the caller to not receive the ambient noise from the mic while I speak. I would go with Bose (QC20 or QC30) knowing that if the background noise is not filtered out well enough on the microphone that they will be happy to take the return. We have never been disappointed in their customer service. They have a lot of technology in those things and I wouldn’t be surprised if they work out great for you.